Ressence, the watch company that keeps challenging the status quo of mechanical watchmaking, is excited to announce the release of the Type 5N, a new example of the oil-filled Type 5 watch featuring a deep night blue dial. 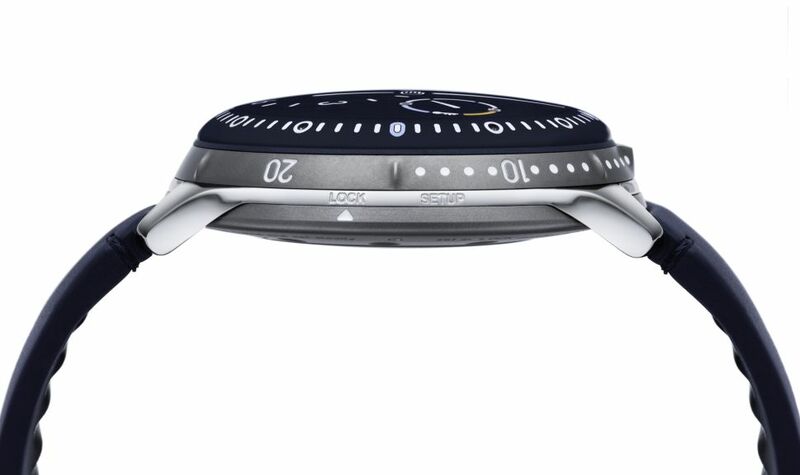 The genesis of the Type 5N starts with the Ressence Orbital Convex System (ROCS), the unique in-house developed (and patented) horological unit featuring an ever-changing dial that continually orbit around one another. The purpose is a more efficient way of telling time. Information is displayed on a single surface, much like words on a piece of paper, making for improved readability. This differs than that of a traditional watch, where the hands and dial are layered on one another producing an uneven viewing plane. Composed of 142 parts, the gears in the ROCS calculates the hours, runner (90 seconds) taking only the minute as a reference from the automatic movement. First debuted in 2015, the Type 5 is the first mechanical watch to be perfectly readable underwater regardless of the viewing angle. A true achievement in Fine Watchmaking, the Type 5N is designed with a "water drop" dial effect in order to achieve crystal-clear dial legibility for the wearer. To accomplish this, Ressence uses applied science. Because oil and glass share very similar responses to light refraction, the eye is tricked into momentarily losing its depth perception. The result is that the watch's dial seems ever closer, vision of it apparently unimpeded by glass at all. The Type 5 builds upon that achievement by canceling out what is known as Total Internal Reflection. Tipically, under water, a traditional diver's watch needs to be viewed straight on in order to be read properly - otherwise refraction turns the glass into a mirror. The use of oil ensures complete legibility whatever the angle of view. The TYPE 5N meets the requirements of ISO 6425 and is able to withstand extreme conditions. The creation of this world-proof watch was therefore not without its challenges - allowing to further position Ressence at the forefront of 21st century watchmaking. 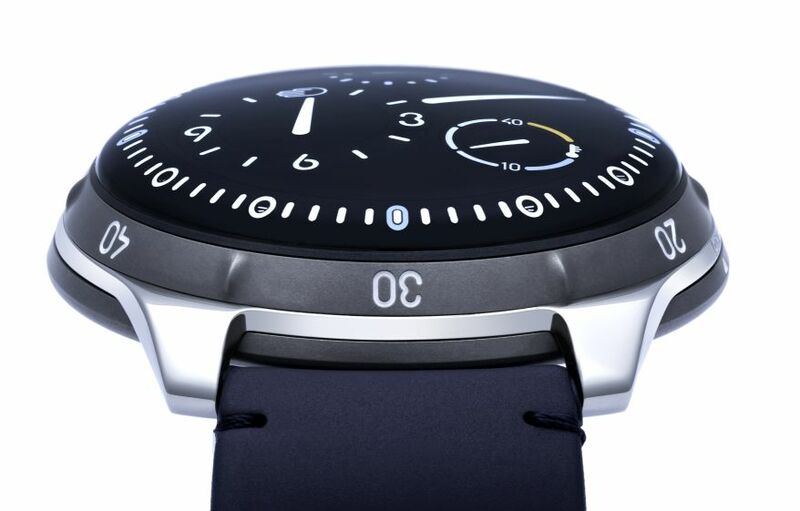 Ressence ingeniously designed a two-chamber system inside the Type 5 to keep the mechanical movement and oil separate. 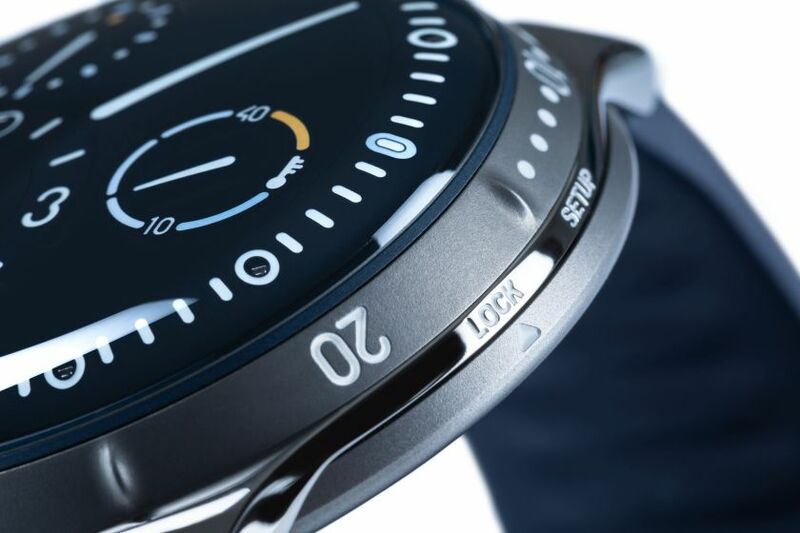 The lower chamber is comprised of the customized automatic movement and the upper chamber is hermetically-sealed with the ROCS display module bathing in 37.5ml of oil. As such with the two-chamber system, there is no direct mechanical link between the watch's movement and the ROCS. To accommodate this, the Type 5N uses a magnetic transmission to tie the modules together. This is done by connecting several micro-magnets to each other and positioning them in both the oil-filled upper chamber and the dry lower chamber. In order to compensate for oil volume fluctuation (dependent on temperature), the watch is fitted with a system of seven small bellows that expand and contract dependent on the increase and decrease of the oil's volume. For a charming visual cue - the system is indirectly connected to the temperature gauge on the dial so the user can see a representation of the bellows capacity in action. Intuitive in viewing and motion, understated in its color scheme, the Type 5N is a perfect example of 21st century watchmaking according to Ressence. The Type 5N eliminates visual complexities and superfluous elements to create a timeless diving watch that is functional and inspires the imagination. The case, in titanium, measures 46mm x 15.5mm. It has a domed sapphire crystals with double AR-coating. Uni-directional bezel. It is water resistant to 100 meters. Movement is the Swiss patented ROCS 5 - Ressence Orbital Convex System - driven by the minute axle of a specially customised ETA caliber 2824-2 with 41 jewels, 28,800 vph and a power reserve of 36 hours. Caseback winding and time setting with RCLS Ressence Compression Lock System. Magnetic Transmission. Compensating Bellow System for the oil. Functions are: hours, minutes, runner (90 seconds), and oil temperature indication. It has a blue convex titanium dial (125mm radius) with 3 eccentric bi-axial satellites inclined at 3° (hours), 4.75° (thermal gauge and runner). Engraved indications filled with SuperLuminova. 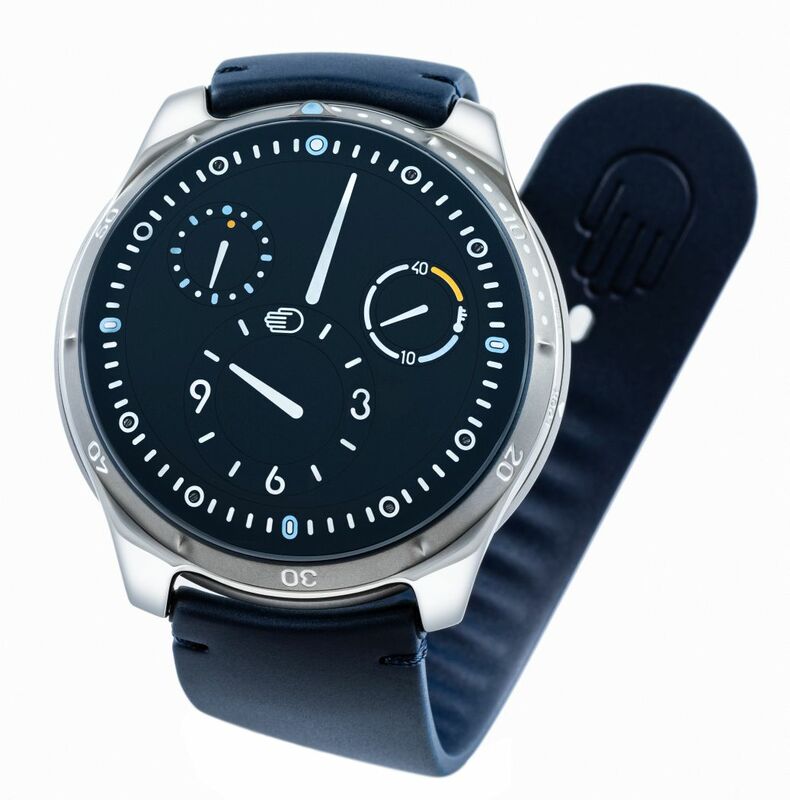 It comes on a 24mm blue Cordovan or blue rubber strap with a titanium ardillon buckle. MSRP is 29,500 Swiss Francs.